The recently completed Apogee Stadium at the University of North Texas is one of the first collegiate venues to generate on-site renewable energy with a set of wind turbines. Three utility-scale wind turbines provide 1/3 of the stadium's annual energy consumption, which coupled with the stadium's energy-efficient design equates to a huge win for the university. Designed by HKS Inc, the 31,000 seat Apogee Stadium takes inspiration from the school's mascot - the eagle, and includes a winged exposed steel structure along with plenty of carbon reducing strategies. Read on for a closer look at this landmark project, and to hear from a couple of HKS architects about the design of the stadium and how a state grant made it all possible. 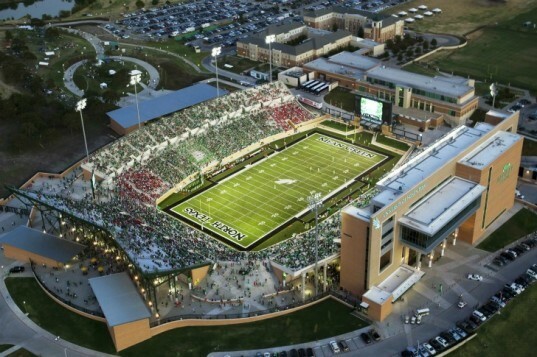 Located in Denton, Texas, Apogee Stadium is the US’s first LEED Platinum collegiate football stadium and the first one to be powered with wind turbines. 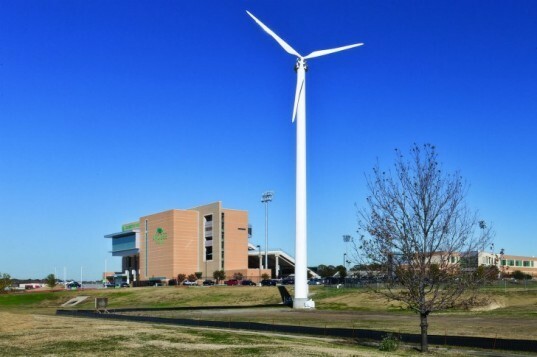 UNT was awarded a $2 million grant by the State Energy Conservation Office for the installation of three wind turbines, which generate power for the new stadium and other buildings on the campus. The turbines offset energy use during events and games, and when empty they generate power for the Mean Green Village, an area of campus surrounding the stadium. Other sustainable strategies like real-time monitoring systems, energy-efficient mechanical systems, and lighting systems also help reduce carbon emissions. The stadium also boasts a natural park-like landscape, permeable paving, habitat and landscape restoration, and drought-tolerant native landscaping. Eco-friendly building materials, like fly ash and low-VOC materials, are coupled with a high level of recycled construction materials. When the stadium is not being used for university games, it is often used by the surrounding community for outdoor concerts, community events and high football school games. We had a chance to chat with Greg Whittemore and Chris Mundell of HKS Inc to learn about this impressive stadium and how the installation of the wind turbines came about. INHABITAT: What were some of the synergies of design and technology that allowed your team to achieve LEED Platinum? Chris Mundell: Reduction in energy consumption was a key goal for the Owner. Many issues were discussed for this project including use of energy efficient Mechanical/Electrical/Plumbing (MEP) equipment, a third-party Commissioning Authority reporting to the Owner, and on-site renewable energy systems. During the design of the project, the engineers created a preliminary energy model to assist the architects with the design of the building envelope. Additional energy reduction strategies included use of advanced lighting controls, mechanical shades controlled by the Building Automatic System (BAS), total enthalpy energy recovery wheels, and differential enthalpy economizers. Lighting power density was managed down to .84 watts per square foot. Another important issue was how to maintain the stadium during non-game days. Sequence of operations and temperature set points were established that reduced the operation of MEP systems when the building was not fully occupied. As a result, the project achieved over 25% energy reduction cost over the baseline model utilized from ASHRAE 90.1 – 2004. 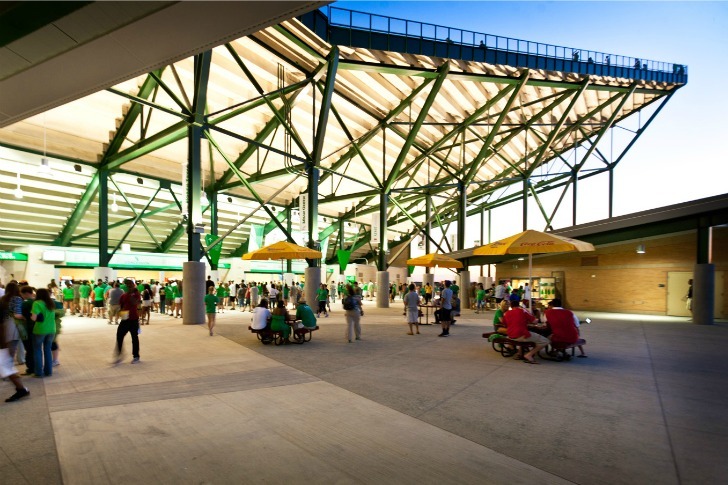 For the site design, the team sought to minimize parking and instead promote a park-like setting around the stadium. This is particularly important considering there are approximately 340 days a year when the venue is not supporting a major event. Over 50% of the site was restored with native and adaptive plants. Other sustainable site strategies included the creation of retention ponds and the extensive use of permeable pavers for storm water mitigation. Such strategies reduced the potable water irrigation needs of the facility by 75%. Due to its location on the UNT campus, alternative transportation was available and encouraged. Campus shuttles, preferred parking spaces for carpooling and fuel efficient vehicles, and on-site secured bicycle storage racks were provided. INHABITAT: Is the new stadium part of a grander scheme on the part of the university to improve sustainability? Chris Mundell: In 2008, UNT became the first large Texas university to sign the American College and University President’s Climate Commitment (ACUPCC). As a signatory of the ACUPCC, UNT is committed to develop a strategy to reach carbon neutrality by the year 2040. UNT has a commitment to push sustainability on all their projects and has achieved LEED Gold on many of them. INHABITAT: How did the wind turbines come about? Was that part of the plan from the beginning? Greg Whittemore: In the initial sustainability charrette we discussed the desire for on-site renewable energy. Our early drawings included turbines on the sports lighting poles, but throughout the design process we continued to search for the most economical solution with the highest efficiency. The three community-scale wind turbines manufactured by Northern were the answer we were looking for. Thanks to the grant provided by the State Energy Conservation Office (SECO) the project was able to include them. INHABITAT: How much of the stadium’s power do you expect the turbines to generate? Chris Mundell: The three wind turbines produce 450,000 kWh annually, which is 1/3 of the stadium’s energy consumption. INHABITAT: What is your team most proud of about this project? Greg Whittemore: The collaborative process between the design team, the University, and the contractor is what I’m most proud of. By working together we were able to create a trailblazing design that is not only a great venue to watch a game, but includes ingrained sustainable features not normally found on a football stadium. This was all accomplished while maximizing revenue generating opportunities and adhering to a tight budget. 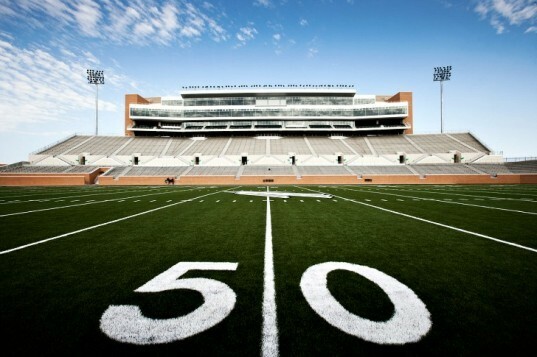 Located in Denton, Texas, Apogee Stadium is the US's first LEED Platinum collegiate football stadium and the first one to be powered with wind turbines. UNT was awarded a $2 million grant by the State Energy Conservation Office for the installation of three wind turbines, which generate power for the new stadium and other buildings on the campus. The turbines offset energy use during events and games, and when empty they generate power for the Mean Green Village, an area of campus surrounding the stadium. Other sustainable strategies like real-time monitoring systems, energy-efficient mechanical systems, and lighting systems also help reduce carbon emissions. The stadium also boasts a natural park-like landscape, permeable paving, habitat and landscape restoration, and drought-tolerant native landscaping. Eco-friendly building materials, like fly ash and low-VOC materials, are coupled with a high level of recycled construction materials. When the stadium is not being used for university games, it is often used by the surrounding community for outdoor concerts, community events and high football school games. The view from the top of the bleachers. The ticket office for the stadium is located underneath yet another soaring wing. Landscaping surrounding the stadium was designed for drought-tolerant and native plants as a way to regenerate the area.